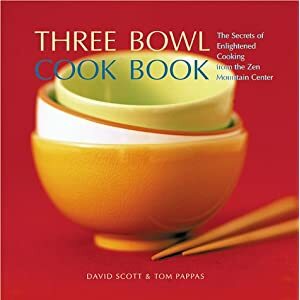 I’ve been browsing the vegetarian Three Bowl Cookbook, laid out as three-part dinners to match the traditional three bowls of food served to monks in Zen monasteries. The three bowls makes for a helpful menu format producing complete meals. Some of the menus were lacking in protein, though, perhaps due to the fact that Zen cook Tom Pappas is not himself a vegetarian. 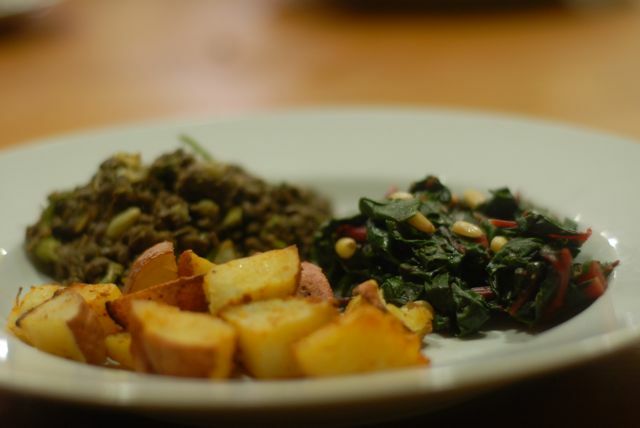 For tonight’s dinner I chose one of the winter menus: Curried Roast Potatoes with Lime, French lentils with Feta and Mint, and Steamed Red Chard with Roasted Pine Nuts. I do a lot of improvising in my kitchen, so I ended up making the lentils with goat cheese, sour cream, and fennel instead. 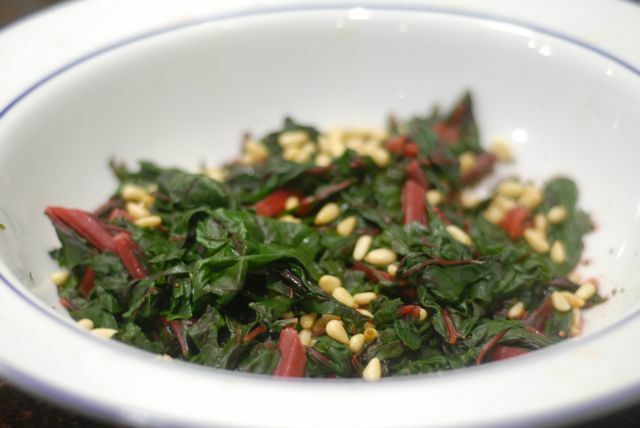 The chard was excellent parboiled then sprayed with a little olive oil. I usually fry greens and wonder how much nutrition is lost by parboiling, so I was hesitant to prepare them this way. But they were good, and the pine nuts on top were a nice touch. My husband liked them better than my usual greens, commenting on their tenderness and that they were not too oily. My son liked them less than my usual recipe but ate them. For the roast potatoes I used two tablespoons of Thai Kitchen Curry Red Paste, which gave the dish some mild warmth. The recipe never mentioned to turn the roasting potatoes in the pan once in a while, which could have caused a problem for a beginning chef. This is a worthwhile cookbook and I look forward to trying some more recipes from it. 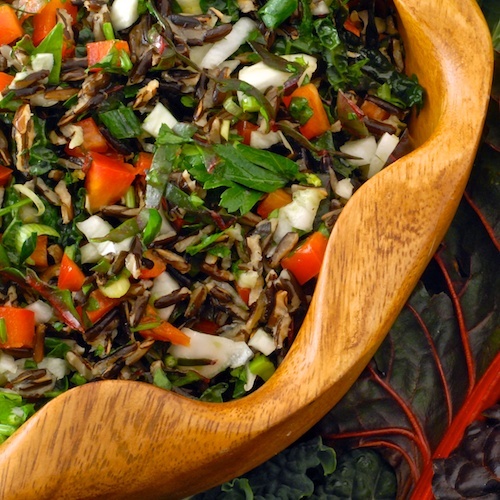 Chard, Kale and Fennel Salad with Wild Rice (Emerald City Salad) Chard, kale, fennel, parsley and scallion, tossed with wild rice, dressed with lemon juice and olive oil. 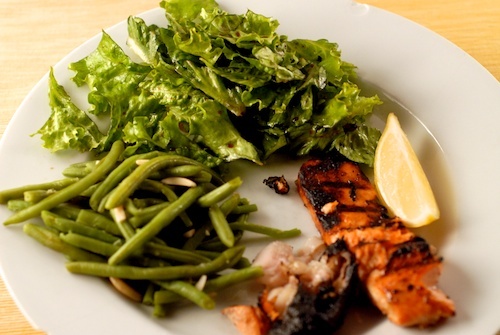 make a hearty winter dinner salad good enough for a teenager to eat. 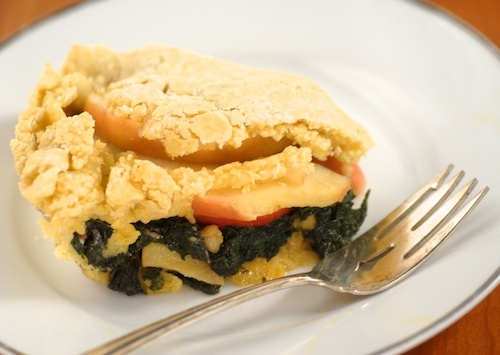 What I Made this Week: David Lebovitz’s Swiss Chard and Apple Tart What I made this week: David Lebovitz’ Swiss Chard and Apple Tart. Don’t be afraid, it’s quite good! How to Roast Beets Roasting concentrates the sweet, earthy flavor of beets. Here are a few tips to make the process easier and more successful. Cooking for my Mom, Gluten, Dairy, and Soy Free Dinners for my mom: dairy, soy, gluten and nut free. 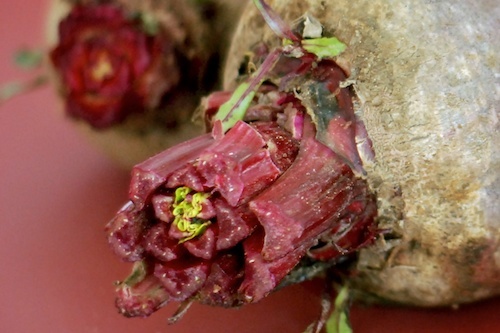 The red chard was amazingly good – probably helps to start with good quality organic chard. Pine nuts were a perfect accompaniment. Instead of parboiling, try water sauteing – basically the same as sauteing in oil, but you use a bit of water instead of oil at a pretty high heat so the water dances around on the bottom of the frying pan. Leaches out fewer micronutrients than parboiling, and might work well for things like the chard.